First line: "I've seen Steelheart bleed." 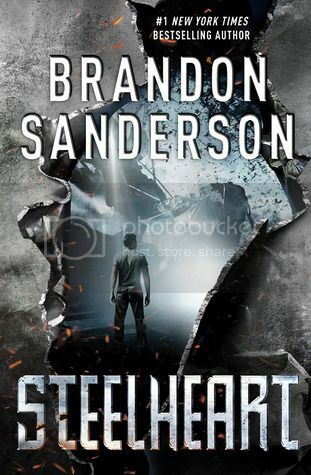 Sanderson's well-thought out and creative take on superheroes stars an ordinary teen determined to take down Steelheart, the all powerful super villain who has transformed Chicago into a dystopian perpetual nighttime metalscape. Ever wonder what Superman would be like if he was pure evil? As usual, Sanderson's world-building is superb and the powers that each of "Epics" possesses are used in unusual and surprising ways. David is your typical, awkward teenage guy - except for the fact that he witnessed Steelheart murder his father during a bank robbery gone wrong and as one of the few survivors of a Steelheart attack, he's lived a life undercover, bent on revenge and intensely studying up on Epics. He hopes to join the Reckoners - a small group of ordinary humans who are fighting the Epics in secret. The book has a fast-paced cinematically inspired style, with plenty of fight scenes and a dash of romance for David. My favorite humorous scene was when David is put on the spot while hiding in plain sight at a gun dealer's shop and amazingly is able to rattle off the specs of each of the weapons in the room. David's wacky misuse of metaphors provides another stock-in-trade measure of comic relief. Graduates of Sanderson's Alcatraz and the Evil Librarians series will especially appreciate this action-packed superhero adventure tale.